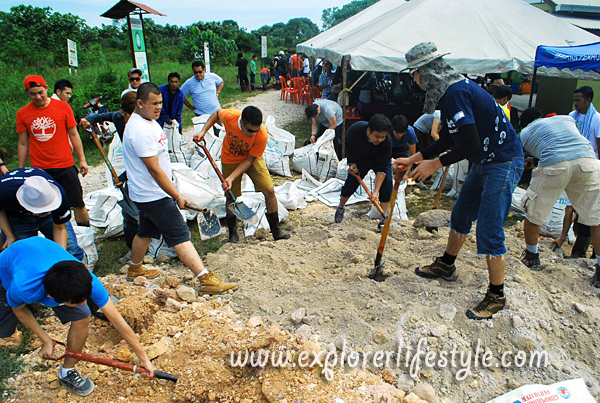 Once again, Timberland Malaysia was involved in a pre-Earth Day event at the Raja Musa Forest Reserve in Selangor with an exciting turn out of 100 people who included volunteers, staff, media and officials. The event which started at about 9.00 am saw an introduction and speech by relevant officials and district officers who explained the day’s itinerary. There were two main groups where a tree planting and canal blocking session was conducted where a local Malaysian lunch was prepared for the hungry group. For ‘Timberland Malaysia, other than actively participating in tree planting efforts in the Horqin desert in Inner Mongolia, Timberland takes this initiative and brings it local through its partnership with Global Environment Centre (GEC), specifically contributing towards the conservation of Malaysia’s tropical habitats via its “Peat Swamp Rehabilitation Programme at Raja Musa Forest Reserve”. Peat Swamp Forest (PSF) is a unique ecosystem unlike any other ecosystem. It is characterized by the accumulation of organic matter (peat) derived from dead and decaying plant materials in water saturated condition. The black peat water is slightly acidic and the ground is wet and spongy. PSFs represent an ecosystem that supports tolerant species that can survive in its unique environment, thus playing an important role in the conservation of biological diversity and storing freshwater resources. It also serves as carbon sink; able to sequester and store carbon as un-degraded organic matter for thousands of years. Timberland Malaysia understood the importance of reviving this unique wetland ecosystem, and has established a partnership with GEC since 2011, to commit volunteers and financial resources for rehabilitation initiatives across the North Selangor region, one of the largest remaining contiguous areas of Peat Swamp forest in Peninsula Malaysia. “Environment conservation initiatives require not only funds, but we also do need people who are willing to get their hands dirty to do the actual hard work. We are really grateful to Timberland Malaysia’s employees for taking time off today to help us. 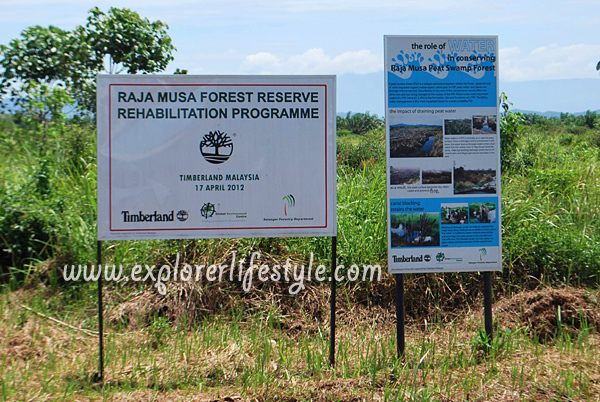 Every bit they do today, will go a long way in helping us save the environment for our next generation and ensuring the sustainability of the Raja Musa Forest Reserve Rehabilitation Programme,” says Mr Nagarajan, Senior Programme Office from GEC. Over 50 Timberland Malaysia employees, business partners and volunteers took time off today from their busy schedules today to help to do their bit for Mother Nature. 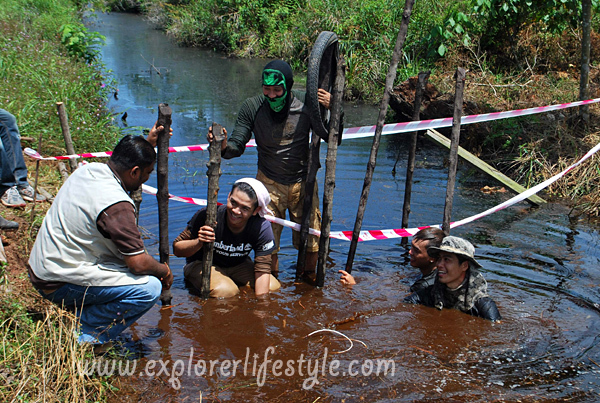 They were there a full day planting suitable trees to re-vegetate the degraded peatland areas, as well as to restore the peatlands canals to keep the peatlands hydrated to reduce risk of fires. Championing environmental causes has consistently remained as one of Timberland’s core Corporate Social Responsibility ideals. From production process to meeting the design criteria and the usage of renewable materials, Timberland has shown great commitment to being an eco-conscious lifestyle brand, reinforcing its identity in being a brand that embodies STYLE + PERFORMANCE + GREEN. The Timberland Global Stewards are a team of 24 committed leaders from around the world who are tasked with maximizing the positive impact Timberland makes in communities worldwide. The Global Stewards will serve as ambassadors of Timberland’s Corporate Social Responsibility platform and will provide leadership, motivation and drive towards specific goals. Timberland, a wholly owned subsidiary of VF Corporation, is a global leader in the design, engineering and marketing of premium-quality footwear, apparel and accessories for consumers who value the outdoors and their time in it. Timberland markets products under the Timberland®, Timberland PRO®, Mountain Athletics® and Timberland Boot Company® brands, all of which offer quality workmanship and detailing and are built to withstand the elements of nature. The company’s products can be found in leading department and specialty stores as well as Timberland® retail stores throughout North America, Europe, Asia, Latin America, South America, South Africa and the Middle East. Timberland is committed to doing its part to address environmental challenges and to minimizing its impact. From product design to manufacturing and shipping, the company is constantly finding new ways to be a little lighter on the environment. The Timberland Earthkeepers® Collection incorporates recycled PET bottles in linings, recycled rubber in soles, leather from silver and gold-rated tanneries and organic content throughout the apparel line. Timberland’s dedication to making quality products is matched by the company’s commitment to “doing well and doing good” – forging powerful partnerships among employees, consumers and service partners to transform the communities in which they live and work. Global Environment Centre is a Malaysian non-profit organization established in 1998 to work on environmental issues of global importance. GEC works regionally and internationally both directly and through many partners. GEC is registered in Malaysia as a non-profit organization (Reg. No. 473058-T). GEC’s mission is to support the protection of the environment and sustainable use of the natural resources to meet local, regional and global needs, through strategic partnerships with communities and like-minded organisations. GEC is registered in Malaysia as a non-profit organization (Reg. No. 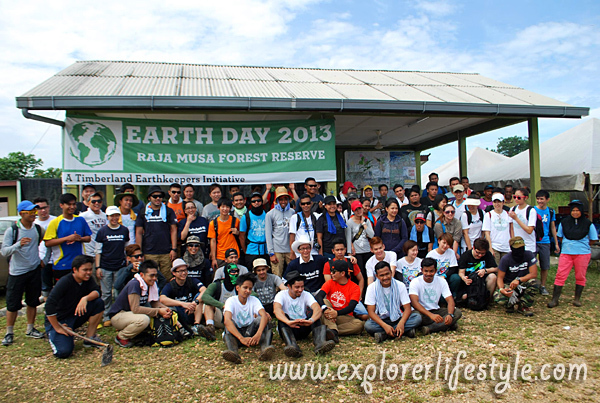 473058-T) which assists the Earth Day with Timberland Malaysia at the Raja Musa Forest Reserve in Selangor.